Research activities at JPL in atmospheric chemistry are directed towards quantifying the effect of human activity on the composition of Earth's atmosphere. Many studies of both the upper atmosphere (stratosphere) and the lower atmosphere (troposphere) involve ozone. Ozone is a molecule composed of three oxygen atoms and is represented by the chemical formula O3. Although ozone molecules in the stratosphere and troposphere are chemically identical, they have quite different consequences for the health of the planet. The stratosphere is dynamically isolated from the lower atmosphere due to the temperature inversion that exists at the tropopause (the boundary between the troposphere and stratosphere). As a consequence, living organisms do not have direct contact with stratospheric ozone. Stratospheric ozone plays the beneficial role of absorbing most of the biologically damaging ultraviolet light emitted by the sun. Numerous studies have shown that damage to plants, animals, and humans ensues from excessive exposure to ultraviolet radiation. Measurements of the total column abundance of ozone reveal a downward trend during the past two decades. Many studies have shown that the build-up of stratospheric chlorine over the past two decades due to industrial production of chlorofluorocarbons (CFCs) is responsible for a significant fraction of stratospheric ozone depletion at mid-latitudes. High levels of reactive chlorine, due ultimately to the decomposition of CFCs, are also the cause of the Antarctic ozone hole. Since stratospheric ozone protects terrestrial life, it can be thought of as "good ozone". The natural, background levels of tropospheric ozone also play a beneficial role for the global ecosystem. Ozone is the primary source of hydroxyl radicals (OH) as well as metastable oxygen atoms. The decomposition of many pollutants, such as carbon monoxide (CO) and methane (CH4), is initiated by reactions with OH and metastable oxygen. Thus, tropospheric ozone plays a key role in the ability of the ecosystem to cleanse itself. The downside of tropospheric ozone is the damage that results when it comes into direct contact with living organisms. Ozone is highly toxic and numerous studies have documented harmful effects on crop production, forest growth, and human health from direct exposure to excessive amounts ozone. Pollution related to industrial activities such as combustion leads to production of tropospheric ozone. Indeed, the concentration of ozone near the surface is a good indicator of overall air quality. Analyses of trends in tropospheric ozone from about 30 years of balloon-borne "ozonesonde" observations from a station in Germany show clear evidence for a rise in the abundance of tropospheric ozone, although trends for tropospheric ozone exhibit significant spatial variability. Since direct contact with excessive amounts of tropospheric ozone is damaging to terrestrial life, it can be thought of as "bad ozone". However, this terminology is somewhat of a simplification given the beneficial role of natural, background levels of tropospheric ozone alluded to above. About 10% of the total amount of ozone between the surface and the top of the atmosphere resides in the troposphere. An increase in tropospheric ozone does indeed provide some protection from exposure to harmful ultraviolet radiation. However, the damaging effects of direct exposure to tropospheric ozone outweighs this beneficial effect. In summary ... human activities such as production of CFCs lead to depletion of stratospheric ozone ("good ozone") and human activities such as automobile exhaust and industrial combustion of fossil fuels lead to increases in tropospheric ozone ("bad ozone"). It is tempting to contemplate solving both the stratospheric ozone and tropospheric ozone problems by transporting to the stratosphere ozone produced by pollution near the ground. However, ozone reacts strongly with other molecules and decomposes when exposed to surfaces. It is therefore too unstable to be transported to the stratosphere. Furthermore, not enough ozone is generated from smog events of the world's cities to replenish the amount of ozone lost in the stratosphere. Finally, any remedial effort would have to be continually ongoing because CFCs have an atmospheric lifetime of 50 to 100 years and are continually causing ozone depletion. Remedies of this nature are too impractical, too expensive, and consume too much energy to be considered. • for the stratosphere, the Montreal Protocol and its Amendments is a world-wide agreement that has essentially eliminated the production of CFCs and other ozone depleting halocarbons. 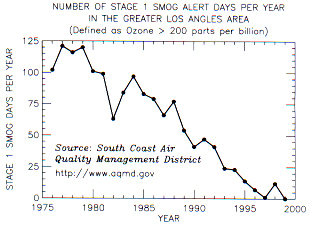 As a result of this landmark legislation, the concentration of stratospheric chlorine is peaking at the present time, as shown by the red line in the figure below. All else being equal, we expect the ozone layer will recover in 50 to 100 years, the time it takes for the atmosphere to cleanse itself of the CFCs that have accumulated in the atmosphere since they were first synthesized in 1930 (click here for a synopsis of important events in the history of stratospheric ozone). The basic science linking reductions in vehicular and industrial emissions and improvements in air quality is understood. However, the necessary controls are often difficult to implement for economic reasons. The actual recovery of the stratospheric ozone hinges on whether "all else will be equal" as levels of stratospheric chlorine decline due to the ban on the production of CFCs. A new concern of atmospheric scientists is the possible cooling of the high-latitude stratosphere due to rising concentrations of greenhouse gases that might lead to more ozone depletion during winter despite the gradual decline in chlorine loading. Another concern is the role of bromine compounds, some of which are not presently regulated, on ozone depletion. Finally, scientists are also concerned that possible changes in stratospheric circulation and/or temperature in the region of the atmosphere between the troposphere and the stratosphere may complicate the recovery of stratospheric ozone by, for example, leading to significant increases in the burden of stratospheric water vapor. Current research regarding the composition of Earth's troposphere is focused on understanding the processes that regulate the global abundance of ozone. It is well recognized that industrial emissions can be transported large distances (e.g., across oceans and political boundaries) provided the emissions are lofted above the "boundary layer" of the lowermost atmosphere by convection. Massive forest fires in the tropics set both by lightening and as a result of "slash and burn" agricultural practices may be contributing to ozone pollution episodes over wide geographic regions. Increases in the concentration of ozone in the upper troposphere since pre-industrial times may have contributed significantly to surface warming because ozone in this region of the atmosphere is a rather efficient greenhouse gas. However, the influence of human activity on ozone levels in the "global troposphere" is not well quantified because we lack sufficient observations to test computer models that simulate the distribution of ozone in this region of the atmosphere. •defining how the concentration of stratospheric ozone will respond to lower levels of chlorine and to feedbacks associated with climatic change. • providing field and laboratory observations to test fundamental concepts of how ozone in the global troposphere is regulated. Laboratory Studies- Measurements of spectroscopic properties of molecules that are critical for the observation of these gases by in situ and remote instruments. Measurements of rates of chemical reactions and the interactions of gases and aerosols that are fundamental to the development of a quantitative understanding of stratospheric and tropospheric ozone. Click here for more information. Field Observations- Measurements of the abundance of ozone and numerous other compounds by air-borne, balloon-borne, ground-based, and space-based instruments that provide scientific evidence of the processes, both natural and human, that regulate the abundance of ozone in the stratosphere and troposphere. The space-based instruments provide a "global perspective", the air-borne and balloon-borne instruments provide a detailed picture of key processes that is difficult to otherwise obtain, and the ground-based instruments provide a record of long-term change in atmospheric composition. Click here for more information. Modeling and Analysis- Use of computer programs that simulate the hundreds of chemical reactions that affect atmospheric ozone to guide the interpretation of field observations in the context of the latest laboratory kinetic and spectroscopic parameters. Use of detailed maps of meteorological data and field observations to define how aerosols and polar stratospheric clouds affect the composition of air. Click here for more information. Ultimately there is a single atmosphere. 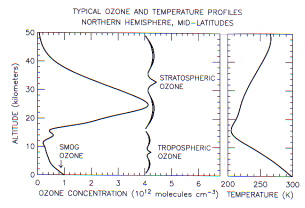 Details of how air is exchanged between the stratosphere and the troposphere is of critical importance to our overall understanding of atmospheric ozone. For example, tropospheric scientists are keenly interested in quantifying the properties of stratospheric air that descends into the troposphere because these air masses supply ozone to the lower atmosphere. Likewise, stratospheric scientists are interested in defining the composition of air as it first enters the stratosphere to better understand the contribution of short-lived halogen compounds to the budgets of stratospheric chlorine and bromine and the mechanisms that regulate the water vapor abundance of the stratosphere. Atmospheric scientist are also working towards defining the chemical and radiative properties of aerosols in the lowermost stratosphere and the uppermost troposphere since this region of the atmosphere is perhaps most sensitive to climate change. The strong commitment at JPL to the three "pillars" of atmospheric chemistry research (laboratory measurements, field observations, and modeling studies) as well as our interest in the composition of both the troposphere and the stratosphere leaves us well poised to continue to contribute to the forefront of atmospheric chemistry research. The Atmospheric Laser Spectroscopy group within the Atmospheric Chemistry Research element is leading the development of numerous instruments to study the composition of the atmospheres of Mars, Venus, Titan and Europa. These instruments use small, light weight tunable diode lasers to measure atmospheric composition and surface mineralogy. The data will be used to better understand biogenic and geochemical activity of the extra-terrestrial surfaces as well as the chemistry and meteorology of the particular atmospheres. This group also leads a JPL Grand Challenge Origin initiative entitled Identifying Chemical Signatures of Life from In Situ Measurements of Biogenic Gases and Their Isotopic Ratios.